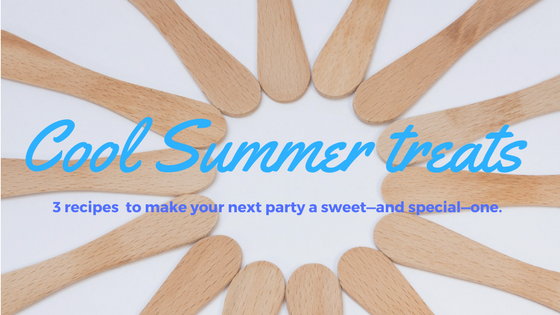 Cool summer treats: 3 recipes to make your next party a sweet and special one. Cool Summer treats: 3 recipes to make your next party a sweet- and special- one. With school almost out and temperatures rising, sometimes the easiest thing is to fire up the BBQ, throw on some burgers and call it a party. After all, who wants to spend time cooking indoors? But when you BBQ often, sometimes a get-together loses its special occasion sparkle. So we’re bringing you three recipes for cool summer treats to make your next party a sweet—and special—one. Add yogurt, fresh blueberries, honey and milk to blender and blend until smooth. Fill each frozen treat mold, and freeze until firm. Swap out the blueberries for mango, strawberries, blackberries or raspberries for a sweeter treat. If you were a kid in the 1980s, you remember these. Not only are they the easiest treat ever, but you’ll also appreciate savouring the nostalgia. Whisk ingredients together for 2 minutes, and fill your popsicle molds. 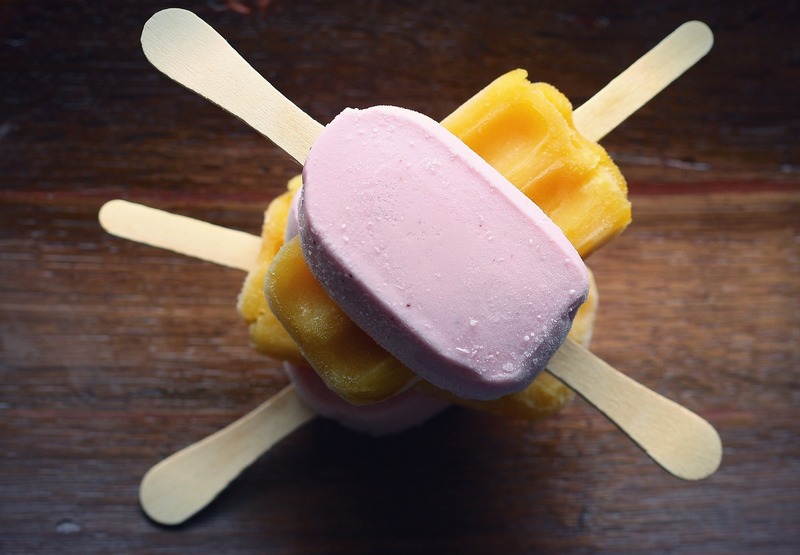 Insert a popsicle stick into each mold, and freeze until firm—usually in five or more hours. Mix all ingredients together, and pour into popsicle molds. Insert a popsicle stick into each mold, and freeze until firm. What is your favourite cool summer treat? Oh yum! Such fresh and healthy ingredients. I think I want to try the chunky monkey – so I get the healthy and a little bit of fun, too! OMG these look positively drool worthy! the blueberry pop sounds very refreshing and I never would have thought to add honey to it! I can’t wait to try these out this summer! A friend bought me a popsicle maker for my birthday a few years ago. I don’t know why I use it so rarely since it’s seriously cool. These recipes are inspiring me to take it out and make the kids’ day. YUMMMMM! These look delicious! Summer is the perfect time to get creative and I can’t wait to try these out with the fam! The BLUEBERRY VANILLA looks perfect for me. I would make these again and again. Easy and yummy. These look great. I know it’s been getting hot here in PA and a cold treat is much needed! Oh boy, you have me craving a Jello pudding pop! I’d have to say my favorite cool summer treat is gelato, but every now and then I like a fruity frozen treat as well. Your recipes both sound perfect and refreshing! Those popsicles look delicious! I want to make those and eat them all myself! Nevermind a party. I want these right now. Lol. Especially the blueberry one. yum! Love the yogurt pops! And your photo is great. What kind of molds did you use? I like the one with the vintage “waves” in it! I am growing blueberries and cannot wait until they are ready to be picked to give this a go. These recipes look sweet, creamy and ready to be in my belly! Yum!!! These all sound delicious!!! Those look so icy and delicious! I could use one right now because it is way too hot today! The blueberry vanilla looks delicious! I’m always looking for great Popsicle recipes! Thanks! YUM!1 nothing says summer like a good popsicle. We love making our own just so we can make cool flavors. Ah these are some nice ones! I think the Chunky Monkey ones are sounding pretty good to me right now. Great flavor combos! I just bought a pop mold last year and my boys love it. I can’t wait to try this recipe! OH those chunky monkey pops sound SO good!!!!!! I love making my own pops and will be trying these for sure!